Founded in 1871, El Molino was one of the first wineries in Napa Valley. Operated until Prohibition and restored in 1981, this small St. Helena-based gravity-flow facility offers ideal conditions for limited production Pinot Noir and Chardonnay. 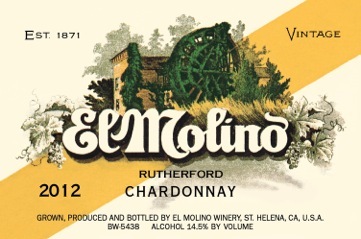 The label is the original design, depicting the historic Bale Mill, or “El Molino.” Grapes are grown organically at the family vineyard on the fabled Rutherford Bench gravel where Chardonnay was planted in 1978 and the first Pinot Noir block in 1991. Winegrowers: Lily and Jon Berlin. Crisp green apple flavors give way to a long-lingering, mineral and acacia-tinged finish – part native yeast, part Montrachet yeast, no malolactic fermentation, and 12 months in 50% new French oak barrels. 695 cases.